Travel with me Dear Readers, to darker times full of mystery and unknown horrors. We’re going back hundreds of years ago when the belief in vampires was common among the majority of the European population. It was once believed that vampires existed and fed on the blood of the living. These vampires could be found in homes, cemeteries, and especially, in charnel houses. 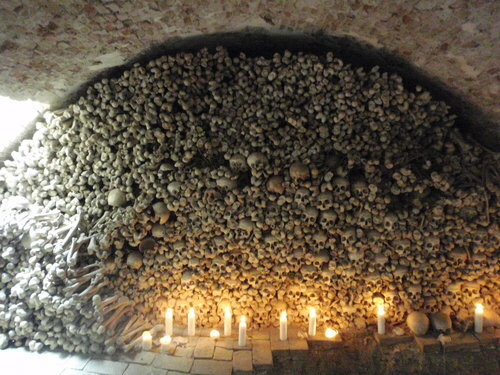 Few people nowadays know of these bone crypts, but they were once thought to be breeding grounds for the bloodthirsty undead. A charnel house is a vault or building of some kind where human skeletal remains were stored. These bone crypts were often built near churches for depositing bones that were unearthed while digging fresh graves, though they were also used for those not deserving of a proper burial. A charnel house differs from cemeteries and graveyards in one big way. Those deposited in one did not always require formal burials. Although some charnel houses were used for the burial of monks and clerics, many others were used as places to bury those considered unclean or unworthy of a proper burial. In parts of Europe, suicides, murder victims, people who had drowned, and those who lived sinful lives were disposed of differently than others because it was thought that the earth would object to their burial. These unworthy bodies could not be left unburied, so the bones were disposed of in a charnel house or something similar. What do these haunting mountains of bones have to do with vampires? Well, it was commonly believed that one of the many ways to become a vampire was to live a sinful life. The wicked were punished by becoming one of the undead. So, with charnel houses being full of the remains of sinful people, it was thought that they were the ideal places for vampires to dwell. Plus, it was also believed in some parts that murder victims were also destined to become vampires. So again, charnel houses were the perfect place for vampires. One of the best opening sequences ever in a vampire film was the charnel house in Werner Herzog’s “Nosferatu the Vampyre” (1979). The powerful, elegant simplicity of the visuals amazed me when I saw it in the theater that year, and now more than ever l love the subdued, understated, yet compelling real-life “horror” of that opening sequence.